Water Slide is a beanie worked top down in garter stitch with twisted stitch cables. The first few rounds can be a bit tricky to work, but keep with it. It gets easier as your work gets larger. Once you hit the body the hat becomes easy peasy to knit. It is written in sizes from newborn to large adult, so everyone in the family can have one. 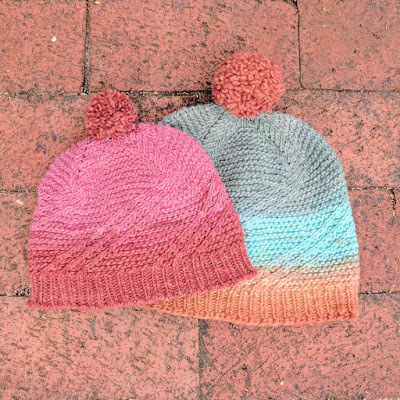 Yardage used varies depending on hat length and the size of the pom pom. SIZING- Newborn (Baby, Toddler, Child/Teen, Adult Medium, Adult Large). Wifi is a simple garter stitch cowl with the addition of short rows that create a striped focal point, but also creates a cowl that is longer in front adding more warmth in the front and less bunching in the back. I'm always looking for fun ways to use up small amounts of textured handspun yarn and this pattern is suitable for both smooth and textured, handspun and commercial yarn. The fringe is an optional design detail. [MC] Super Bulky Single Spun Yarn, 80 yards, 5 WPI. Shown in purple. [CC] Super Bulky Single Spun Yarn, 40 yards (less if you don’t add fringe), 5 WPI. Shown in magenta. 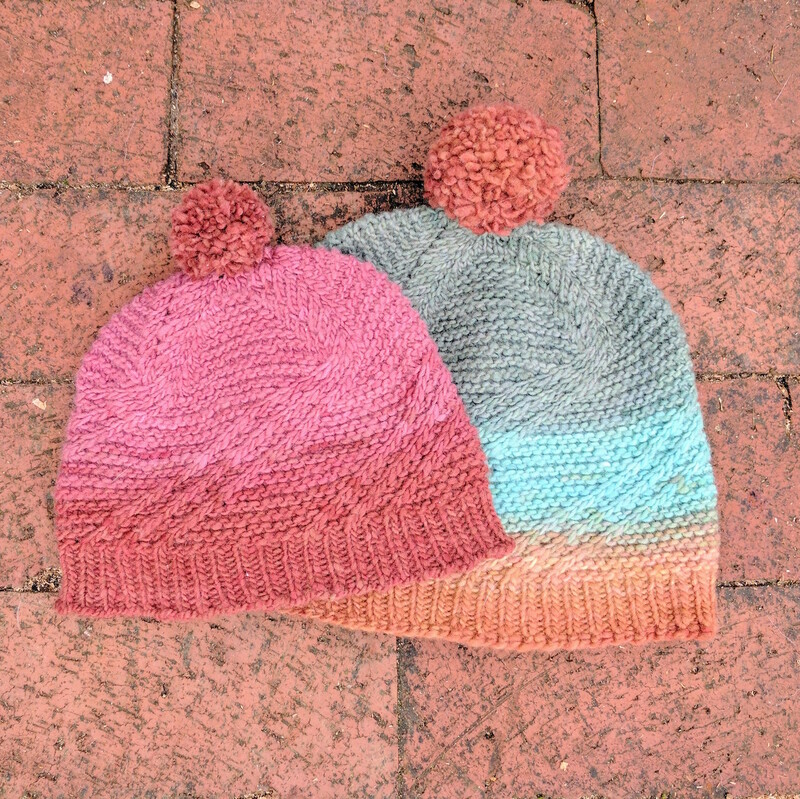 The Freebie hat was inspired by a beanie I owned years ago. I loved it so much. It was slouchy and cozy, made of wool, a ribbed design that wasn’t bound off at the brim, but had elastic running through the live stitches to give it a very flexible fit. People often asked me if I had knit it myself. When I replied that I hadn’t I was met with the response “Oh”. You know the Oh- disappointed, slightly pitying because everyone involved thought that you SHOULD have knitted it. They gave the look that I was practically a fraud for wearing a knitted item that I hadn’t knit myself (maybe I’m reading into it too much). In any case, I stopped wearing the hat because I did feel like a fraud, and eventually the hat disappeared. I miss that hat, so I made my own much cooler hat inspired by the original. Anyone who has learned to increase and work in the round can make this hat. It’s knit from the top down in 1x1 ribbing and it isn’t bound off, elastic stretch cord is threaded through the live stitches to keep them secure and give a nice stretchy and flexible fit. Bulky Hand Spun Yarn- 6-7 WPI, 60-80 yards minimum, more if you wish to add a pompom. 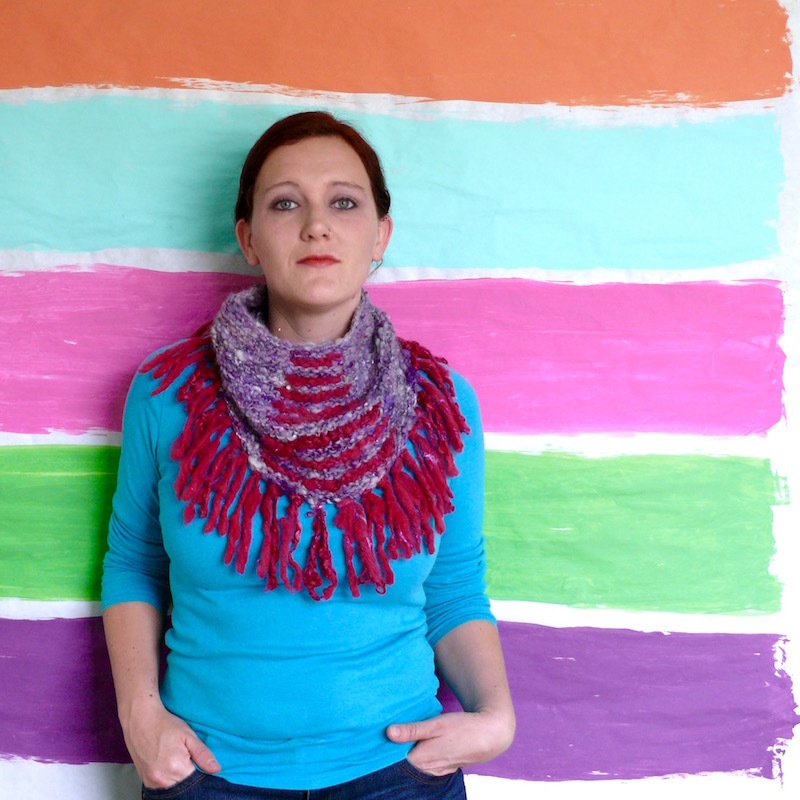 The sample was knit in a merino blend 3-ply yarn. 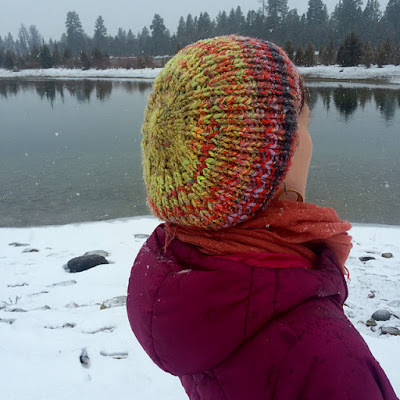 SIZING- Can be worked to desired size, hat has a very flexible fit. Width: 7” laying flat at brim, slightly cinched by elastic thread. Width: 9” laying flat at brim, slightly cinched by elastic thread. Sizing: One size fits most children/adults. Sizing can vary based on the relaxed sizing of the pattern. Repeat Instructions: When instructions occur within ( ) or [ ] followed by a number to repeat, you will repeat the instructions between the ( ) or [ ] that number of times. All sizes: Using size 10 needles and Long-Tail Cast On, CO 6 sts. Place marker and join work into the round. On the next round, switch to size 10.5 or 10.75 needles. On the next round, switch to size 11 needles. For child size continue to body instructions. Continue working in K1, P1 ribbing until hat reaches 8.5”, you run out of yarn or reach the desired length. Secure yarn end and weave in ends. Measure the circumference of your head and cut 2 strands of elastic thread 2” longer than that measurement. Thread elastic through your live stitches, they will act as your “bind off”. Tie each strand together separately, as tightly as is comfortable for you. You are using 2 strands in case 1 breaks, that way you still have a strand holding your sts together. Weave in elastic ends as you would yarn ends. I wet blocked my hat and formed it over a kitchen mixing bowl to dry so that there wouldn’t be any creases, but you may block your hat however you desire. Pompoms are optional, but if I had had extra yarn I would have made one.